Regarding WAPO science writer Sarah Kaplan’s recent review of scientific commentary on the UFO phenomenon, she seems oblivious to a basic truth: There is a distinct and fundamental difference between merely having an opinion, and having an informed opinion, on any given topic. This holds true for scientists and laypersons alike. Because very, very few scientists have actually studied the UFO phenomenon before holding forth, their pronouncements about it must be viewed for what they really are: Pontification with little or no data to support their dismissive assessments. 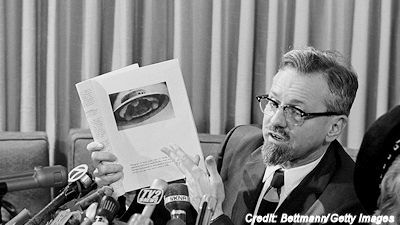 Granted, while Kaplan mentions the investigative efforts of astronomer Dr. J. Allen Hynek—whose initial skepticism about UFOs was eventually discarded, after he analyzed a number of genuinely inexplicable sighting reports compiled by the U.S. Air Force during the 1960s—she devotes most of her article to touting the demonstrably uninformed utterances of UFO skeptics such as physicist Enrico Fermi and SETI specialist Jill Tartar. Despite, or perhaps because of, the Air Force’s ongoing attempts to suppress the frequently high-quality data on UFOs it collected, McDonald began to investigate the phenomenon on his own time and at his own expense, while ignoring the very real risk to his scientific reputation. Although this was merely an opinion, it was after all an informed opinion on UFOs, something very few other scientists could offer, then or now. Many of McDonald’s published papers, private research notes, and personal letters relating to his investigations of the UFO phenomenon are now accessible at the University of Arizona, providing insight into the cautious reasoning underlying his dramatic conclusions. While most scientists (and science writers) are quick to dismiss as impossible the idea that UFOs are alien spacecraft, very few of them will ever make the effort to learn whether any evidence exists to suggest otherwise. Instead, they merely continue to assert that, as an idea, it simply does not work. In other words, most scientists reject outright the validity of UFO research, refuse to engage in it, and deliberately ignore the intriguing data compiled by a handful of their more inquisitive, less-biased peers. If this were not enough, despite their profound unfamiliarity with the subject, many of these same intransigent individuals preach about UFOs in the most shameless and presumptuous manner. If they were to apply this same “methodology” to their own research, their colleagues might justifiably consider their conduct incompetent, if not fraudulent. Nevertheless, it is rare to hear a scientist speak knowledgeably about the UFO phenomenon and rarer still to find one who has actually studied it. Robert's newly revised book, UFOs and Nukes: Extraordinary Encounters at Nuclear Weapons Sites, is now available on Amazon. Hi Robert, I wrote the book -- "The Close Encounters Man," the biography of Dr. J. Allen Hynek -- on which Kaplan was commenting, and my take-away is different from yours. For me, the most important point wasn't that the article was skeptical, but that the article was written by the Post's science writer, and not some entertainment editor or "News of the Weird" editor. That fact alone, in my opinion, signifies that the Post actually took my book seriously, and how often does a paper like the Post take a UFO book seriously? I want my book to start public discussions like this (and I hope your readers have smart, lively responses to your essay!) Because ultimately that's the best thing for the study of UFOs. Socorro was one of the cases that pushed Hynek over the edge, and it is still one of the 701 'unknowns' from Project Bluebook. I have an unseen video recording of Hynek talking about how he missed key evidence in that case while talking with ray Stanford.